We were introduced to Loc Truong, the General Manager of East West Brewing Co. after speaking with a few of the other craft brewers in the city. A project that started in May and broke ground in August, East West Brewing Co is due to open for soft launch this week. 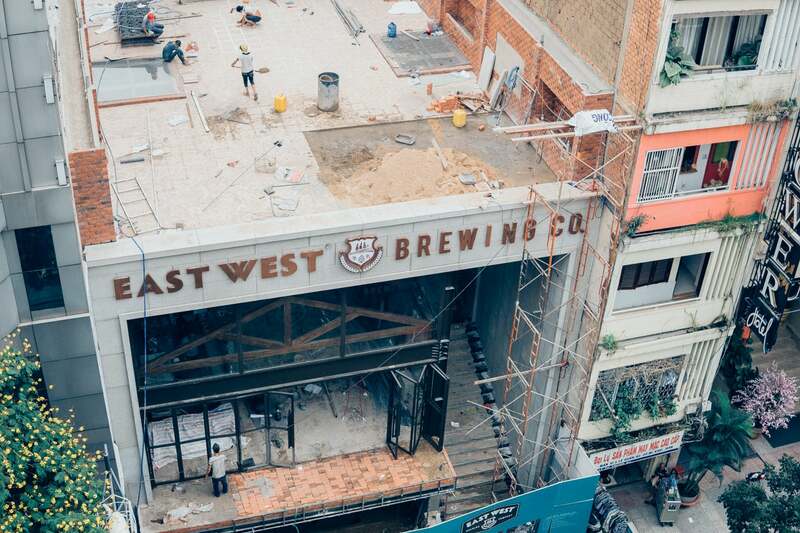 An impressive 1600 square meter structure right in the heart of Ho Chi Minh City on Ly Tu Trong, the East West team has its eyes set on shaping the beer culture in Vietnam for years to come. We had the chance to speak with his team to learn about their business strategy and vision for East West Brewing Co. And as we toured the building grounds, we were lucky enough to catch the aroma of the malt from across the street at his team’s offices. Can you tell us about East West Brewing Co.’s strategy behind opening a tap room and brewery in the same location? Why invest into that rather than distribution? Distribution is tough and time-consuming. It’s a business strategy that we’ll go after in time, but we know that a tap room and brewery has the opportunity to produce more value for us and our customers. A lot of people know beers. But fewer are able to appreciate the process for crafting the beer. We want to be open and transparent about the brewing process, so people can see it happen for themselves. We want to grow people’s appreciation of the process. Is there enough room in the market for more craft beer? 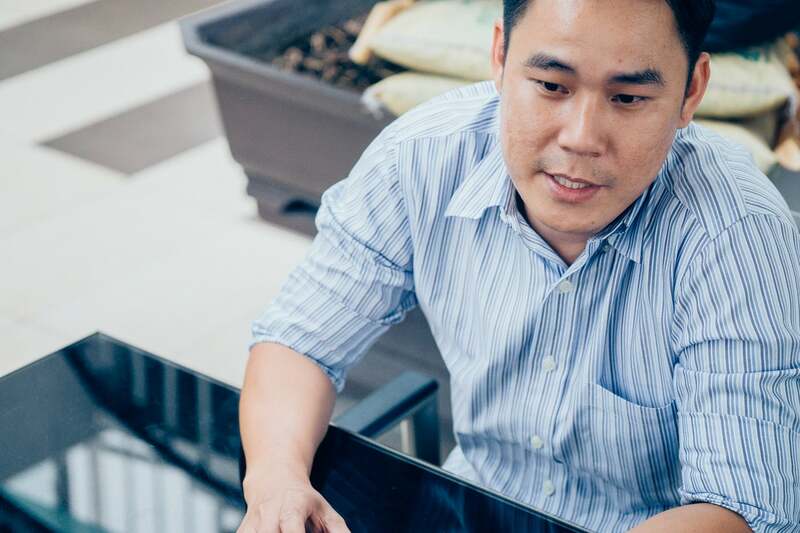 What makes Vietnam an attractive market for it? Vietnam is one of the top beer consuming countries in the world per capita. But a lot of people ask: is there room for people to switch from what they’re drinking now over to craft beer? The answer is yes. Because as the country’s GDP grows, more Vietnamese have more disposable income. They’ll eventually trade up to more premium product. Craft beer is by no means a luxury product. But what it represents is the most important: taste, quality, craftsmanship. There’s a lot of room in the market for artisan beer. So what is the target audience for craft beer in Vietnam? The expat and overseas Vietnamese market is not getting large enough to keep up with the supply of craft beer products and tap rooms. Is there more room to sell in those segments? I don’t think so. I do believe that the market as a whole will grow. There’s a lot of untapped territory that craft beer hasn’t gotten into yet. Can you share with our readers a bit more about your background before starting East West Brewing Co.? I’m Vietnamese-American, originally from San Diego. I went on a study abroad semester at sea program in 2005. Basically you spend four months on a cruise ship touring different parts of the world with a group of other students. Vietnam was among one of the countries that the ship stopped at. Once you arrive at a destination, you get five to seven days off to explore on the ground. It was my first time coming back to Vietnam. I left when I was six. After graduating from the University of San Diego, I started work at Wachovia Bank. My itch to explore and do something by myself was not even completely driven by Vietnam. I couldn’t stop thinking about this sense of adventure I had while I was a student. What could I do it to have it again? I didn’t necessarily want to commit to another corporate structure. It was a toss up after a couple years at Wachovia: go to New York City or take a chance and go to Vietnam. 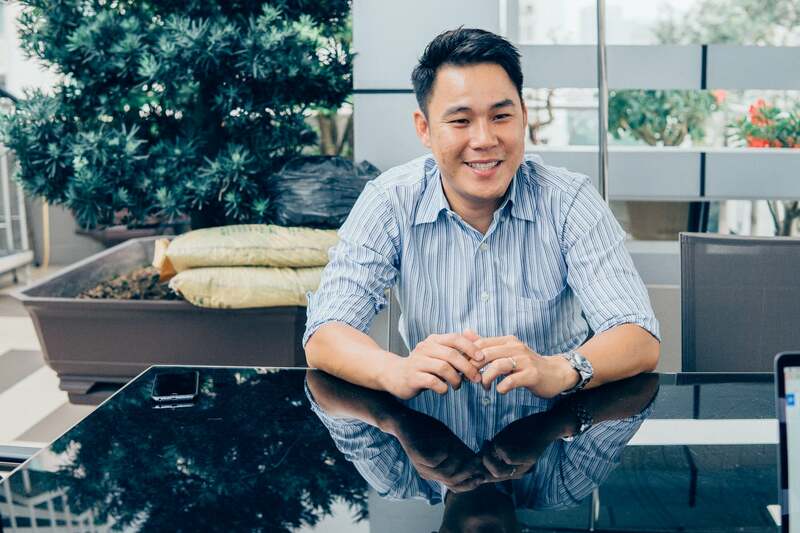 I landed in Vietnam with a entry-level job at Indochina Capital, a developer in resorts and high end real estate. I eventually went into building businesses, the first being Chill Skybar. At first, people thought we were crazy. It’s hard enough to get someone to get in the ground floor front door. Who would go all the way up to a rooftop? These are skeptical people mentalities. They see challenges before opportunities. I was a small sweat equity shareholder in the business, helping with sales and marketing. It was an instant success back in the day. There was never a bad day of business. While Chill Skybar helped redefine Vietnam’s F&B scene with a rooftop concept, it was a concept and brand that was hard to scale. That was when I met one of the managers of Chill Skybar. A French guy who had just finished a stint in Shanghai. We were having casual office conversation, when he mentioned that Budweiser was preparing to enter the Vietnam market. 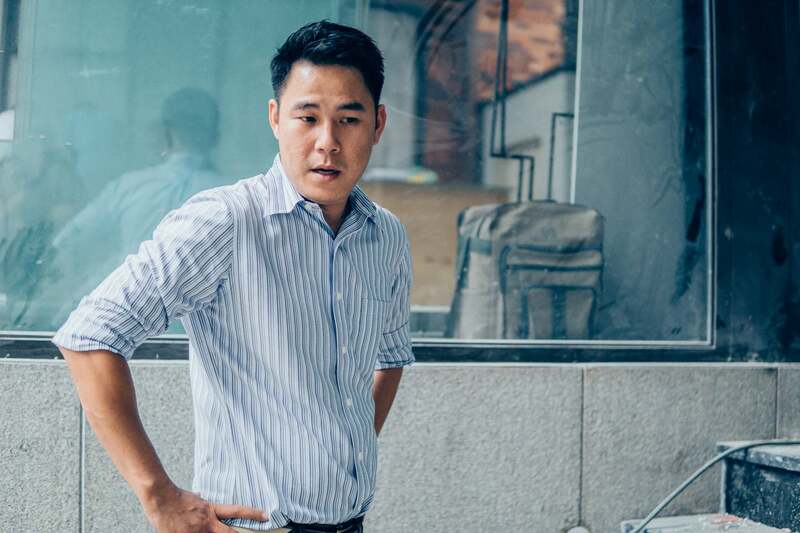 I eventually got connected to the team at Budweiser Vietnam and got a role to help launch and expand their business here. While it was fun to learn the ropes of commercial marketing for a big beer company, I decided that I wanted to go for another startup business. That’s when the concept of East West started. I took a trip back to San Diego where I visited all the breweries. San Diego is the mecca of craft beer. After a couple of months, I put together enough insights and what it takes to build a proper craft beer operation. Mixed in with my experience helping to launch Chill Skybar, that’s how we ended up where we are today. Can you tell us the story about how your team found the Ly Tu Trong location for the site? The place originally wasn’t for rent. A family aunt lives right across the street and one day while having dinner at my aunt’s home, I noticed a for-sale sign going across the building. This was even before the developmental stage of the East West concept . A few weeks later, I decided to give the owner of the building a call. 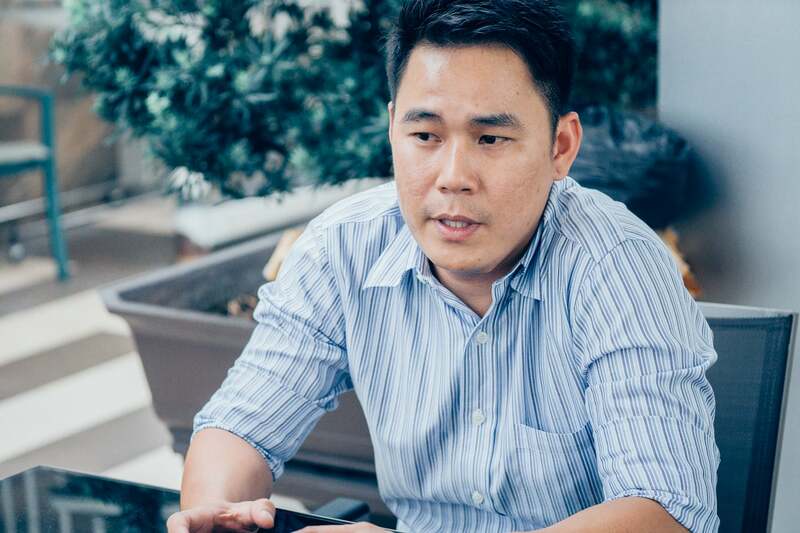 At the time, I was under enormous pressure looking for the right place, specifically one with at least a 700 sqm footprint enough for 200-300 seats. Every location had its own problem that prevented me from moving fast. While the building was already sold, I asked the owner if the new buyer would be open to leasing. The new owner wanted to meet to understand our team’s vision. He’s a successful entrepreneur in the shoe business and travels overseas a lot. In fact, he owns the hotel next to us. He saw our passion and it led us to signing the lease. And the rest is history. 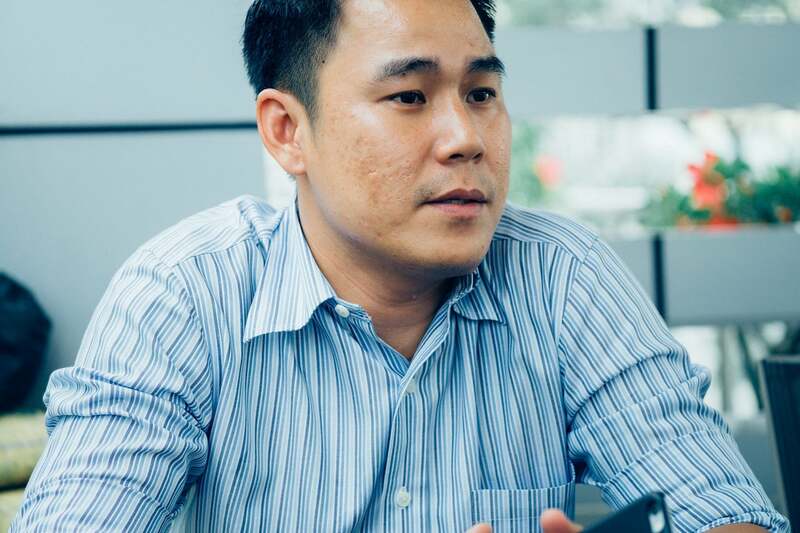 What’s one short, memorable story about doing business in Vietnam that you’ll always remember? 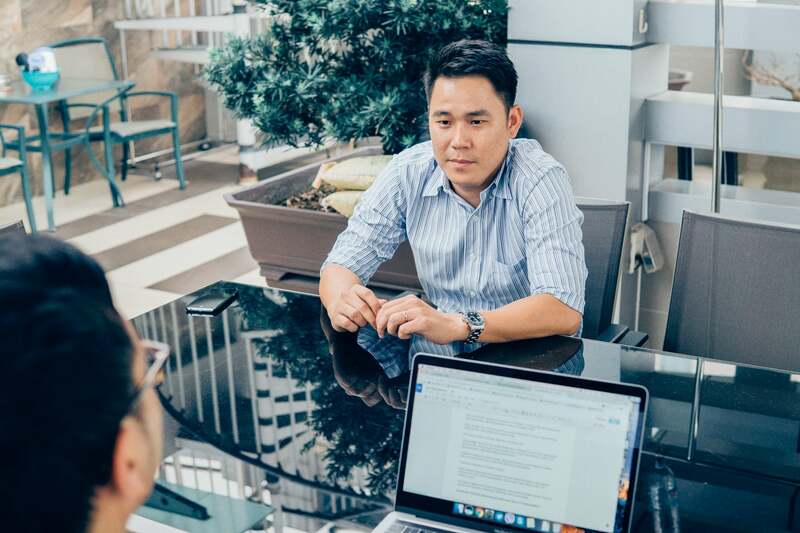 Many business stories share a similar theme: having the right Vietnam-proof attitude and mentality. The more calm you are about things, the fewer things will get to you. Things here move so fast. 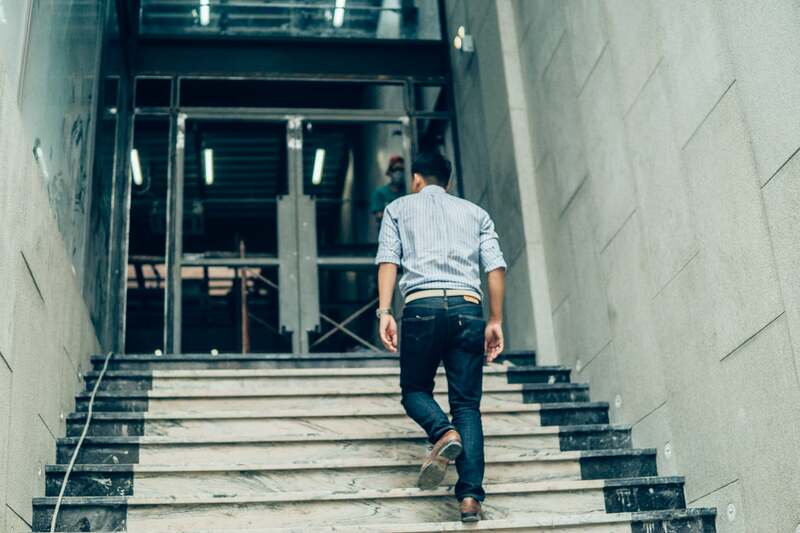 It’s dangerous if emotions drive a lot of your business decisions, especially as a foreigner. You have to be patient and take your time. Don’t overreact to anything. It’s more clear with the rules in America. Here you don’t have rules. There are more grey areas. Either you jump in full or you start small. Anything in between, you set yourself up for challenges. The East West team doesn’t care about the rest of the market or other places opening at the same time. Don’t let it get to you. Go at your own pace. And don’t allow outside people and businesses around you take away from your direction. How did you build the team? It looks like you have a team of experienced brewers and restaurant staff. Today, we’re excited to have talents like Sean Thommen our head brewer and Cyndi Tran our executive chef to lead the opening of East West Brewing Co. When we set out to build the team, we looked for a combination of three factors: First, we wanted to feel each other out for our experience and abilities. Sean asked me: do I understand the market? I asked Sean: does he have what it takes to lead a brewery? What does he know about a brewery and what is his experience? Secondly, we want to attract people who are like-minded. In order to make big decisions, they have to trust themselves and trust me. And third, is just pure luck. I was ready to pay a large sum to a Canadian consulting company, First Key, to help me design the brewing system. Right before that, Sean showed up through email. He saw one of our Facebook posts that mentioned we were looking for a head brewer. Before meeting Sean, we interviewed seven brewers. No one had the right character or experience. Then Sean suddenly popped out of nowhere. Things worked out last minute. You work hard and create your own luck. Jimmy Phan from the KOTO Foundation. It’s a non-profit organization helping at-risk and disadvantaged youth opportunities in hospitality. We have a strong plan for our Corporate Social Responsibility and plan to work closely with them. I’d like to instill a company culture to make sure we don’t forget. How do we make Vietnam a better place, if we create value and make money here?